The age of online share trading is here. Websites and trading apps help you in buying and selling stocks with just at a click. The age of online share trading is here. Websites and trading apps help you in buying and selling stocks with just a click. As of now, individuals are able to carry out buying and selling of stocks within the fraction of a second using the electronic transaction service. Online investment work on a principle of lower brokerage and also recommend the best stocks to buy, best mutual funds to invest in, upcoming IPOs, corporate bonds, futures and options, equity derivative, etc. To get started in Indian share market, you need to have a PAN card which is 12-digit alphanumeric code provided by the Income Tax department. It is essential for executing any financial transactions in the country. PAN is also mandatory for opening a bank account, participating in mutual funds, filing Income Tax returns, etc. The individuals/companies/online agencies that are certified to purchase and vend on the stock markets are called brokers. An individual cannot directly sell and buy stock of any company; he/she can only sell or buy stock via a broker. Brokers are listed and licensed by SEBI; the latter controls the share markets in India. 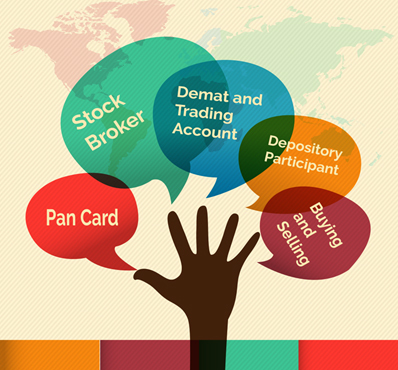 Once you have a broker, you require a demat and a trading account. A demat account is an account that will keep the stocks or shares that you purchased in your name; this represents your stock portfolio. You cannot store shares in physical form or collect them materially. They must be in a dematerialized or demat form. Online trading account is an account where buying and selling of stocks takes place. Trading account is like an intermediate that assists the buying and selling of stocks. There are two depositories in India: NSDL (National Securities Depository Limited) and CDSL (Central Depository Services Limited). Their participants are called as depository participants; they offer an account to hold the stocks which are purchased. To buy and sell any stock, one is required to inform broker through call or through the Internet. All the selling and buying of stocks and commodities takes place in two popular exchanges: BSE (Bombay Stock Exchange) and NSE (National Stock Exchange). However, there is generally a small variance in the price of stocks at both exchanges. Your dream is just a click away, grab it soon.